Kantary Hills, Hotel Chiang Mai Shop Coordinator Panisara Phummapooti (front row, 5th from left) welcomed the Chiang Mai University Faculty of Fine Arts’ members and students, led by Associate Dean for Academic Research and International Affairs Faculty of Fine Arts Assistant Professor Sunandha Ratana (front row, 4th from left), during their recent visit to Café Kantary in Chiang Mai. (PTGIO) board members Wuttipong Arayatumsopon, Janet S. Henry and Dr. Dirk Weeber met Governor Wichien Puthiwinyoo on Tuesday, February 11 at his office at City Hall. The German Friends of Thailand organization gave the Governor two pictures of their event Let’s Celebrate from November 5, 2013 showing the Governor and his wife meeting HRH Princess Soamsawali. Dr. Dirk Weeber also presented the Governor with antique bank notes from the era of the German Emperor Wilhelm the II von Hohenzollern of 1908 as a special gift and an invitation card to his 40th birthday to be held at the Imperial Mae Ping Hotel later the month of February. In return the Governor gave the PTGIO team members a commemorative silver coin of the founder of the Chiang Mai administration estates in a purple colored gift box. 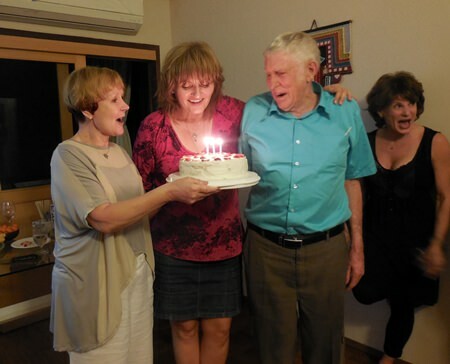 Friends and partygoers celebrated Kerstin Luebbert’s birthday with her at her condo on Friday, February 7, 2014. Here Kerstin (center) is seen blowing out candles on her birthday cake as friends join in singing her a very Happy Birthday. President of Wichai Wittaya Bilingual School Metin Askin presents Managing Editor Shana Kongmun with a New Year’s gift at their lunch meeting at the Shangri La Hotel Chiang Mai on Wednesday, February 5, 2014. President Metin talked about the school’s upcoming trip to Turkey as part of the 11th International Language And Culture Olympiad supported by UNESCO and held annually in Turkey. 150 countries participated last year with over 2,000 students and 300 students. Activities and performances were held in 54 cities in the event organized by the NGO Turkceder. There is a Culture Fair every year as well which features booths from 150 countries and 11 stage performances, over 3.3 million people visited the Fair in 3 days last year. This year the School hopes to organize a trip by local media as well and sought the Chiang Mai Mail’s assistance in contacting news organizations and interested sponsors. Central Festival Chiang Mai held a Meet the Press event for the new Denim Zone with stores from 5 global brands; Levi’s Lee, Wrangler, McJeans, Lee Cooper and Hara. Additionally the Denim Zone is the only place in the North that offers jeans from such brands as Armani, Versace, Gas and G-Star Raw. The event introduced these leading brands to local media as Central Festival Chiang Mai is the largest retailer of denim and jeans in the North. 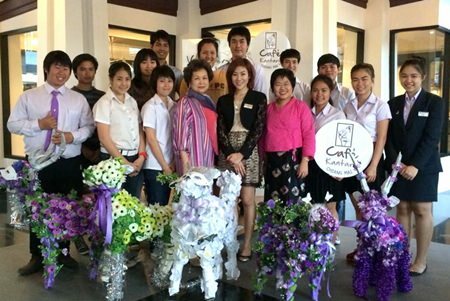 Suchart Chaimongkol, General Manager of Central Festival Chiang Mai said that Central Festival Chiang Mai is the leader of fashion in Chiang Mai and the north with a variety of products of leading brands and full services. 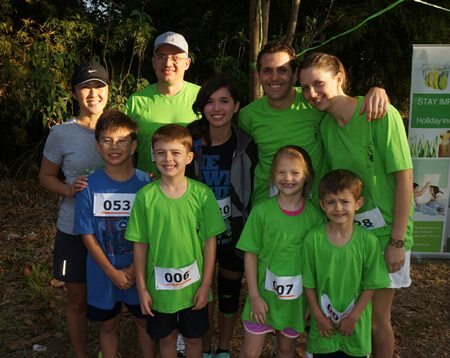 The 10th Annual Run for Relief was held at Huay Tung Tao Reservoir on Saturday, February 15, 2014. The biggest turnout so far, the event raises funds to help people who are facing persecution in Burma and funding critical relief and medical work for impoverished people in Burma. All funds raised will go to help the Internally Displaced People (IDPs) in Burma. In addition to the 5k run/walk there was a 100 meter dash for kids. (Photo courtesy of CityNow! ).